Microsoft has finally released the official version of the popular Microsoft power point, Excel and Word for iPad this week. 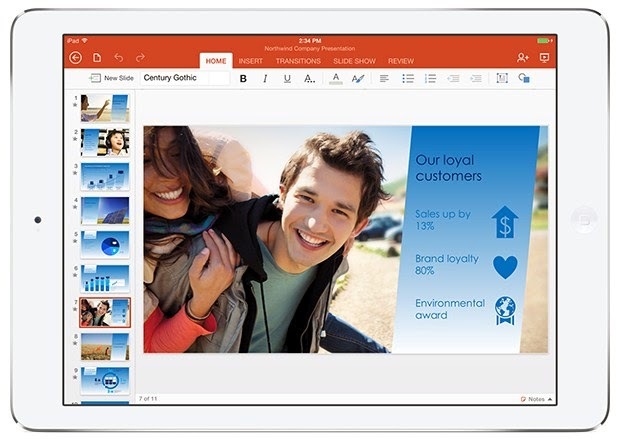 According to OfficeBlog, the applications were made with full consideration of what people love about office and how they would have loved to use it on their tablets. The Office for iPad has been made to look very much like the Office you've always known with it's robust capabilities and familiar look. The applications are available in paid and free versions depending on how you plan to use it. The free version allows you to read your word documents, view your excel data and present with the power point while the Paid version (with an Office 365 subscription) unlocks the full capabilities of your Office on iPad by allowing you to edit and create new documents on the iPad which is what you won't get on the free version. The documents edited on the iPad maintains the content and formatting across all devices so you have less to worry about. Below is a video on how it works and the Download Link is at the bottom as well. Enjoy! Don't miss out on exciting Infos like this anymore, use the links below, CHEERS!